The domestic nature of the work is indicated by an opening scene of home and hearth made of white marble on a glossy black floor. 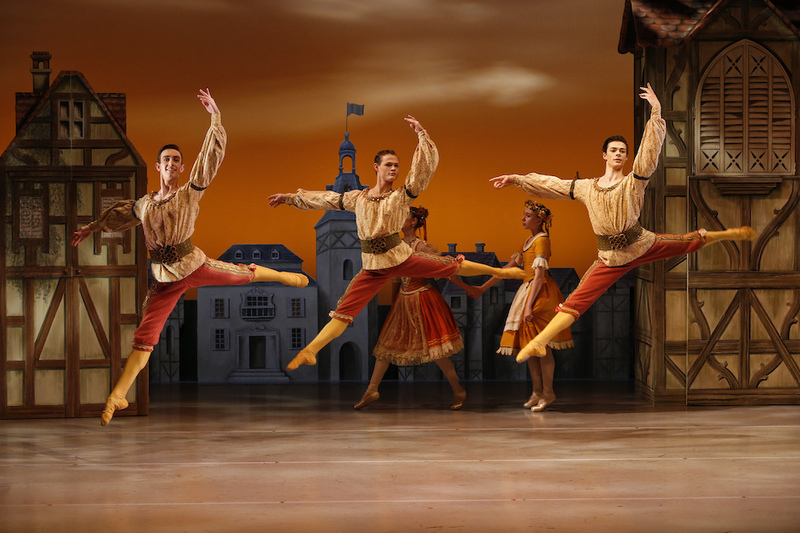 During the overture, the floor glides back and slowly moves vertically upward, eventually inverting the statuary precariously overhead. 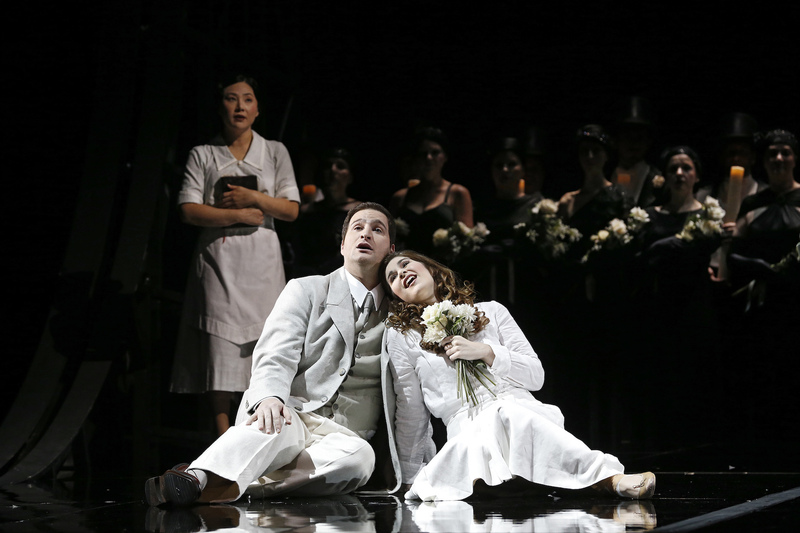 As black clad mourners bearing flickering candles and white flowers process in a slow, mournful square about the stage where Luisa Miller’s body lies encircled by white roses, the overture seems to preview the tragic end for the titular heroine. As the opera begins, however, it is daybreak, and the local villagers welcome the morning by serenading dear Luisa. 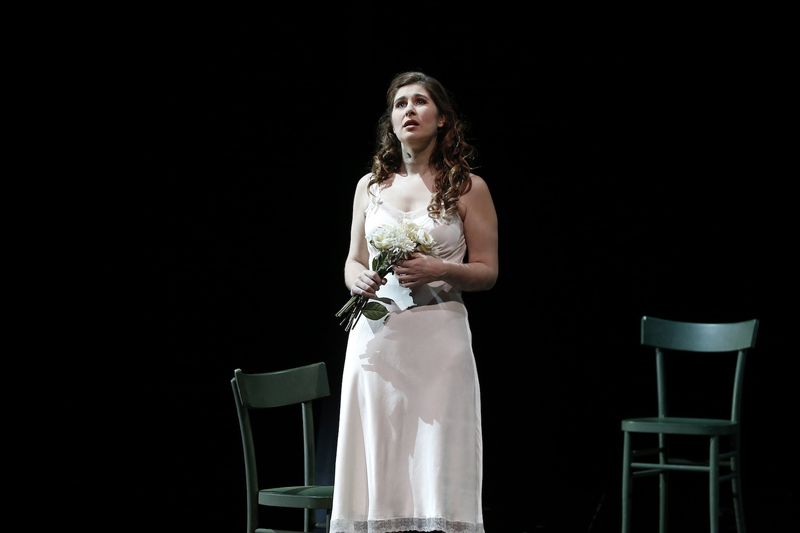 Written as Verdi entered his middle period, Luisa Miller reflects features the familiar Verdi fascination with fathers and daughters. Luisa’s resolve to marry Rodolfo concerns her dearly loved father, Miller, and the pair is soon threatened with jail by Rodolfo’s father and the villainous Wurm. Forced to renounce Rodolfo in a letter, Luis is reunited with her father but the fate of she and Rodolfo is sealed. First seen at Opéra de Lausanne in 2014, this sleek new production takes an abstract approach to time and place, simply allowing the action to speak for itself in the polished, pitch-black setting designed by William Orlandi. Formal attire adds further elegance. Orlandi clearly delineates the characters, with Luisa in virginal white, Miller in a light suit, and the dastardly manipulative characters in black. Federica, the self-centred duchess that Rodolfo’s father wants him to marry, is practically a black widow spider in her dramatic outfit. 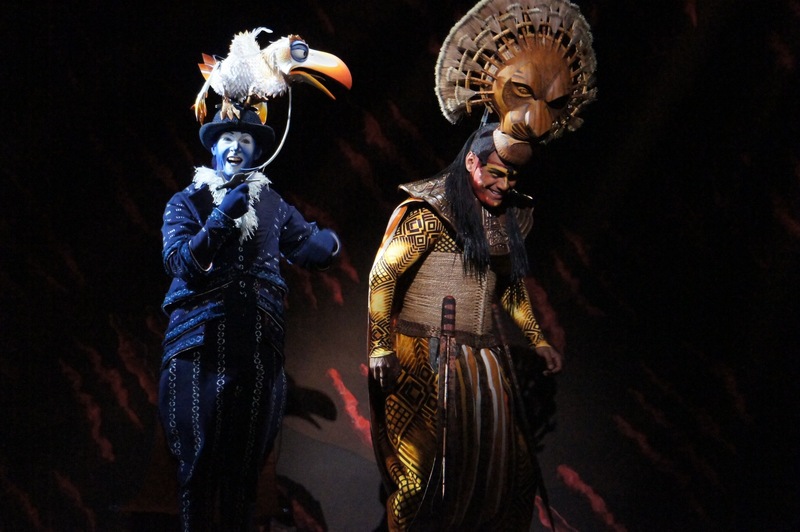 While the overall costume design is excellent, the similarity of the black-clad men could have caused a difficulty in terms of recognition, but the outstanding cast, under resident director Matthew Barclay’s guidance, has created strikingly distinct characters that loom larger than life. Original director Giancarlo del Monaco represents Luisa and Rodolfo’s private pain as a force that places them each in a prison of loneliness akin to the actual prison that holds Miller. 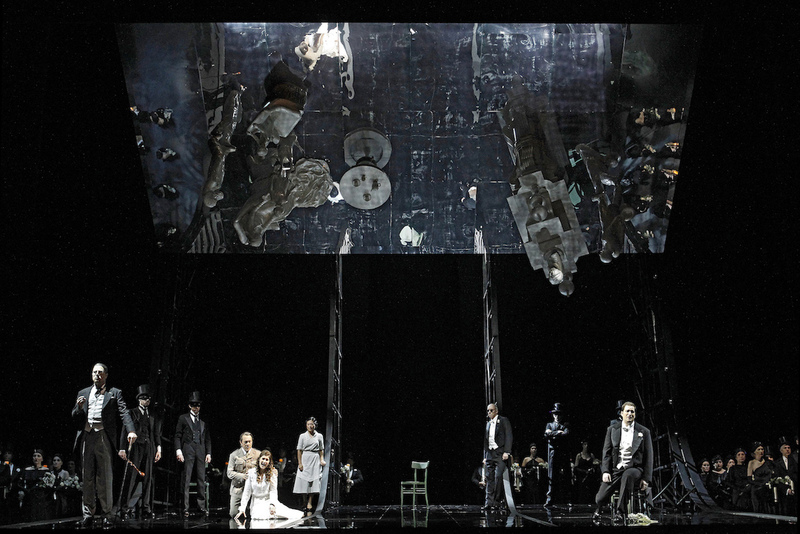 In a final scene very similar to Aida, the tormented couple meets their tragic fate as the mirrored floor slowly slides back into place, closing the opera by reinstating the original setting. The large ensemble works as something of a Greek Chorus, sharing news with the protagonists and informing the audience of the status quo. Anthony Hunt’s preparation of the Opera Australia Chorus is, as ever, confidently masterful, with diction and dynamics at premium levels. While the richly melodious score may be unfamiliar to audiences, maestro Andrea Licita leads an intricately detailed performance of the score from Orchestra Victoria. Mellow clarinet work is a feature, as is the harp and percussive bells. From orchestra, chorus and principals alike, the thrilling act one finale was an absolute musical highlight of the evening. In marketing and publicity, Opera Australia has made no secret of the fact that this production is a showcase for the exquisite talents of Australian soprano Nicole Car, who is rising meteorically in international prominence and acclaim. Car more than lives up to the scrutiny of this pre-loading of expectations, sweetly singing in lush, full bodied tones of liquid beauty. Winning the audience’s affection instantly with her first aria “Lo vidi e’l primo palpito,” Car’s strength as an actress allows her to convey the extremes of Luisa’s joy and sorrow, emphasising the noble traits of the character rather than allowing her to be a victim. High profile Italian tenor Riccardo Massi completes the attractive lead pair as Rodolfo. Massi’s voice is capable of romantic tenderness and ringing power; he and Car sound wonderful together. As Rodolfo reflects alone at the end of act two Massi’s performance of “Quando le sere al placido” demonstrates the tireless strength of his high notes. An imposing presence, Massi makes Rodolfo’s deadly impulse in the final act quite believable, yet still draws sympathy as the end draw near. In a warm and characterful performance, Michael Honeyman convincingly plays an older man. 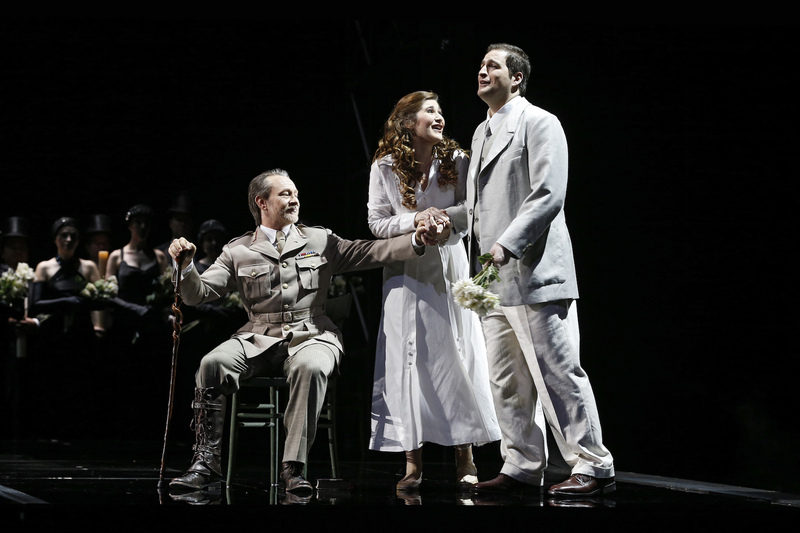 As Miller, baritone Honeyman sings with unwavering purity yet colours his tone with the vulnerability of the deeply protective father. 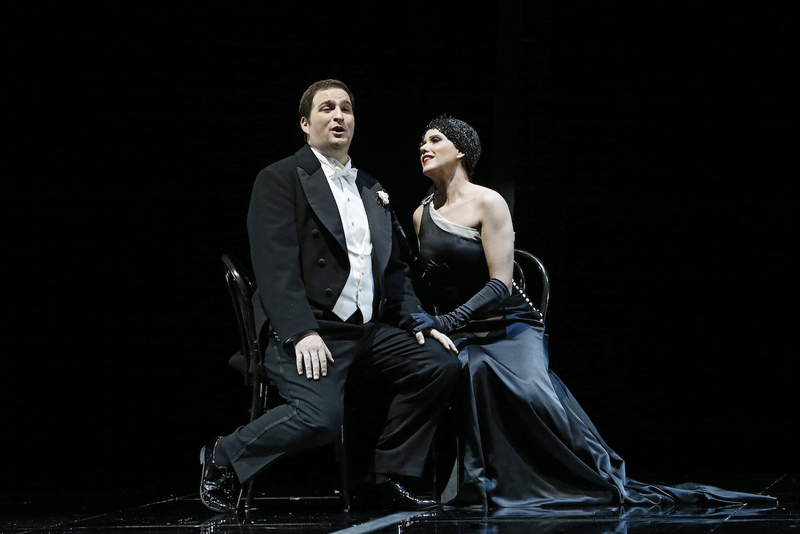 As father and daughter, Honeyman and Car enjoy great chemistry, and their final bittersweet duet “La figlia, vedi, pentita” is memorably affecting. David Parkin is just as convincing, in terms of playing a role above his own age, as Rodolfo’s viciously selfish father Count Walter. Parkin’s strong voice and commanding presence allow him to present the Count as a fellow not to be taken lightly. In his second highly impressive appearance of this Melbourne Autumn season, Steven Gallop is a truly hissable villain as the insidious Wurm. As their characters plot and scheme in act two, fellow Australian basses Parkin and Gallop join forces to sing “L’alto retaggio non ho bramato” and the result is electric. In the utterly thankless role of the viper-like duchess, Sian Pendry establishes the character’s threatening presence with slow and deliberate moves and an intense focus. Like Car, Pendry is as strong an actress as she is a singer. Her expressive, meticulously controlled mezzo-soprano voice creates exactly the effect Verdi intended in contrast with the sweetness of Car’s voice. The almost entirely a capella act two quartet sung by Car, Pendry, Gallop and Parkin is an extraordinary musical highlight of the evening. 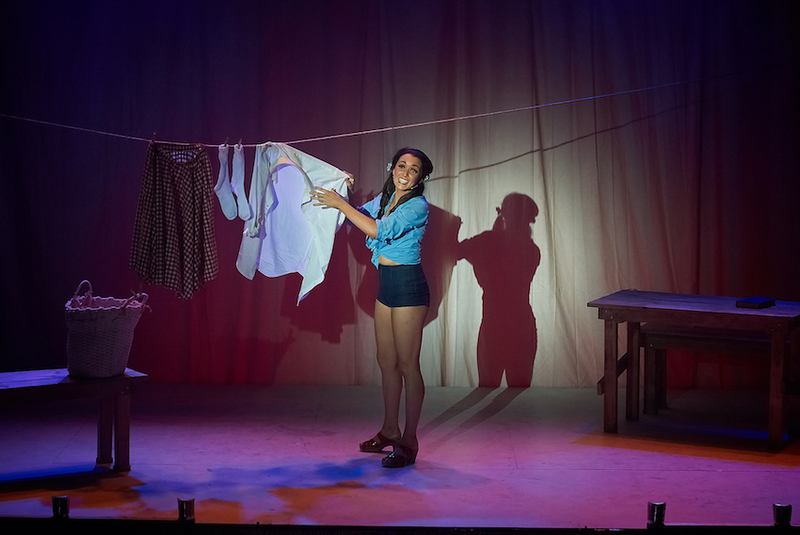 The quality casting continues right through to Luisa’s maid Laura, sung and acted beautifully by distinguished Young Artist Eva Kong. 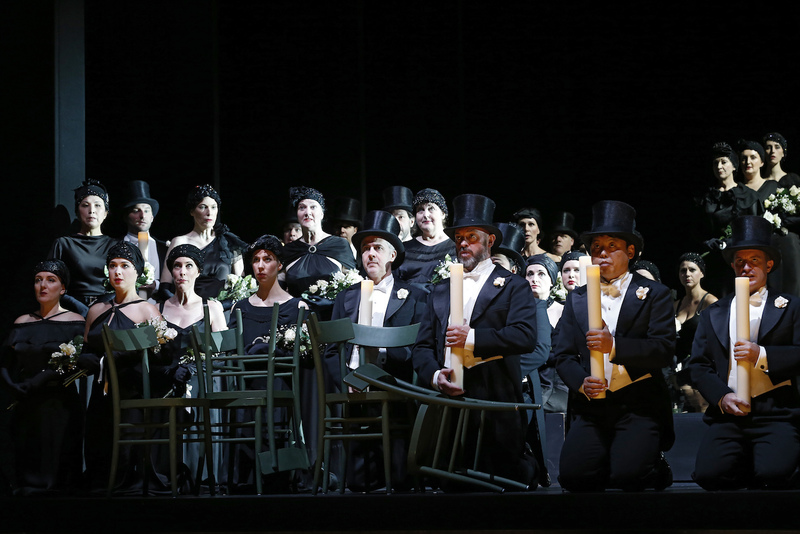 Lovers of opera, and Verdi in particular, will revel in the high quality of Luisa Miller. 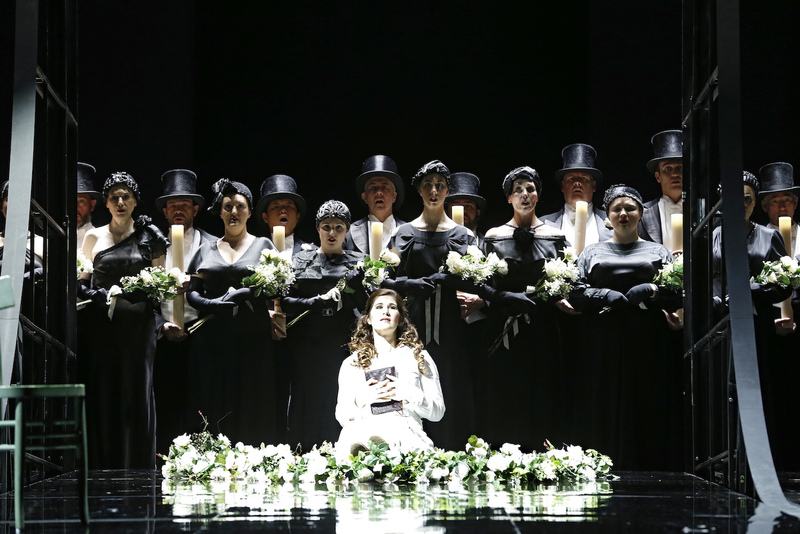 Luisa Miller plays selected dates at State Theatre, Arts Centre Melbourne until 27 May 2016. I was not at all well in May, so missed both The Pearlfishers and Luisa Miller. Having read both your reviews, I’m not heart-broken about the first – the plot of which is almost as unbelievable as Il Trovatore, but I really really regret not having heard (and seen) Nicole Car live in the Verdi. We are so spoiled for choice, and our Australian musicians – especially the soprani – are doing us proud! Meanwhile, I’m quietly descending to planet earth after the best Sydney International Piano Competition ever.